One of the biblical themes that I never get tired of preaching and teaching is justification. Every time I’m faced with teaching it, I know that I’m going to be personally encouraged again with the riches of the gospel. I have no trouble at all getting pumped about justification. It’s just so amazing what God gives to sinners like me. This kind of theology always brings me to doxology. Yet, sadly, I find that there are Christians for whom this just doesn’t float their boat. It doesn’t impress them. It doesn’t leave them in awe and wishing they could love God more than they already do. There are various reasons for that. In some cases, perhaps it’s because they’re not really Christians — after all, unregenerate hearts don’t get excited about the gospel. In other cases, perhaps it’s because they haven’t been taught justification very well. In the latter scenario, it’s more a matter of ignorance. Believers are robbed of joy and God is robbed of glory because these believers have been somewhat short-changed in how they’ve been taught. I want to put my finger today on one particular point where I’ve periodically found a lapse in how justification is taught in Reformed churches. I’m doing this for the sake of joy. I’m doing this to help brothers and sisters exult with me in the treasures we have in Christ. I’m doing this so that we’ll all be more impressed with God and the gospel. Justification is always described in courtroom terms. There is a judge (God), and there are the accused (us). We’re accused of sinning against God’s laws, never having kept any of them, and still being inclined to all evil. We’re faced with an eternal death sentence from the Judge. Into this picture steps Jesus Christ. He is our advocate, our Mediator. He intercedes for us with his work on our behalf. There’s a verdict from the judge. Now this is where things sometimes go off the track and we might miss something of how the rich the gospel truly is. Some say that the judge’s verdict is “innocent.” Because of what Christ has done, we are declared innocent, they say. We’re not entirely wrong in doing that. In justification, God does forgive us all our sins because of Christ’s work on the cross. You can say that he wipes our slates clean. Our accounts are cleared of all our wrong-doing. As a consequence, we are indeed innocent, acquitted. That in itself is something quite amazing. A non-Reformed writer once portrayed justification simply and only in these terms. He compared it to a game of golf. In golf, if you’re in a tournament or something like that, you can get these do-overs called “mulligans.” This writer said that God wipes our score-card clean of all our mistakes, and now we get a mulligan. We get to try again. How is that good news? There is a better way to understand all this, but it begins with going back to God’s demands. God justly demands that all our sins be addressed through his infinite wrath. Christ met that demand of God’s justice by being our substitute on the cross. However, God also demands perfect obedience going forward. He does not relax that just demand of a perfect life because we’re forgiven. This is where a good gospel gets even better: we have Christ’s perfect obedience throughout his life to meet that demand. Romans 5:18-19 teaches us that Christ’s obedience is a key element of our righteousness before God. That obedience is credited to us, it’s put on our accounts. Therefore, in the sight of the Judge, it is as if we ourselves had always been and always will be perfect obedient. Consequently, the verdict that’s issued is not merely “innocent” or “acquitted.” It’s something far better: righteous! It’s a verdict that you won’t find in an earthly courtroom. But in the heavenly courtroom, God declares sinners to be righteous — not only forgiven, but also seen in Christ as perfectly obedient. Sinners are seen as Christ is seen. This is to be seen in the very Greek word for justification: dikaioo. That word and its relatives all pertain to “righteousness,” which is, by definition, a far richer word than innocence. Because God’s courtroom is so much more amazing than any earthly courtroom, what the Judge does after the verdict is even more amazing. Since he sees the sinner as he sees his Son, he takes that sinner and brings him or her into his family. The Judge takes the sinner out of the courtroom and into the family room. He says, “You are my child and I am your Father.” That can happen because justification is more than being found innocent or acquitted. That’s why I find justification so incredibly encouraging. Not only am I innocent before God, I am positively righteous in his eyes. This is something that cannot be undone. I have everything I need to stand before him, both in this life and in the age to come. It all comes to me through my Saviour Jesus Christ, through his substitution. I am God’s righteous child through a life I did not live and through a death I did not die. Wow! Can I love him just a little bit more? From l to r: Dr. Ted Van Raalte, Dr. Jason Van Vliet, Rev. John Bouwers, Dr. Cornel Venema, Dr. Bob Godfrey. A couple of weeks ago, there was a synod of the United Reformed Churches in North America. 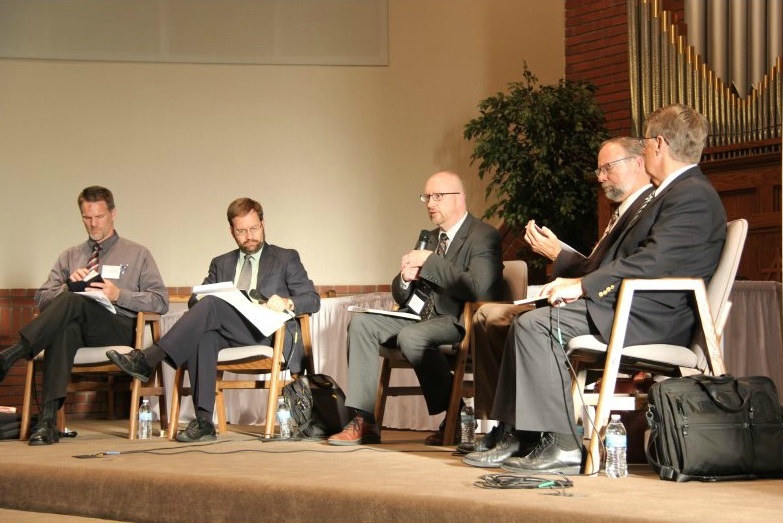 One of the noteworthy things that happened at Synod Visalia was a colloquium or discussion about covenant theology between theologians of the URCNA and of the Canadian Reformed Churches. Representing the URCNA were Dr. Cornel Venema from Mid-America Reformed Seminary and Dr. Bob Godfrey from Westminster Seminary California. The CanRC representatives were both professors from the Canadian Reformed Theological Seminary, Dr. Ted Van Raalte and Dr. Jason Van Vliet. The colloquium was an initiative of the URCNA Committee for Ecumenical Relations and Church Unity (CERCU). It seems that fears and suspicions about covenant theology in the Canadian Reformed Churches continue to beleaguer efforts to work towards a merger of our federations. Hence, this colloquium was proposed as a way to help clear the air. Most reports that I’m hearing suggest that it definitely was a step in the right direction. I commend CERCU for organizing it! Prior to the colloquium, a couple of documents were prepared by the participants. You can find those documents here, prefaced by a letter from the CanRC Committee for Church Unity to CanRC church councils. The first document is from the URCNA representatives and lays out their position. The second is from the CanRC representatives. They answer some questions posed to them by Dr. Venema and Dr. Godfrey. I want to note a few things about the CanRC contribution to this discussion. First, it needs to be recognized that Dr. Van Raalte and Dr. Van Vliet are not presenting the “official” covenant theology of the Canadian Reformed Churches. Apart from what our confessions say (which is not much), we do not have such a theology worked out in the kind of detail you find in this document. Second, Dr. Van Raalte and Dr. Van Vliet are both professors at our seminary. Thus, it can be said that this is representative of what is being taught to our seminary students. The imputation of the active obedience of Christ in our justification. They unambiguously state that this is the position of the Three Forms of Unity. That, in justification, law and gospel are antithetical. That covenant and election are not to be identified with one another, though they are connected. That there are different “outcomes” with regard to those in the covenant of grace: life or death. The activity of faith in justification is merely receiving or accepting the free gifts of Christ. I could add more, but those are some important highlights. I keep hearing that the colloquium was recorded on video, but I have not yet seen or heard of it being posted. I will let you know if I run across it. I do know there will be some further follow-up in Christian Renewal. Daniel Hyde’s take on the colloquium will be published, as will a response from Dr. Van Raalte and Dr. Van Vliet. I look forward to reading that interchange and pray that all of this discussion will further the cause of unity.